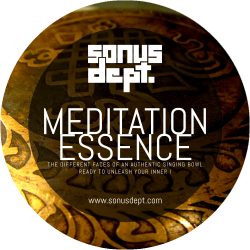 Meditation Essence is a sound library for Native Instruments Kontakt that features the sounds of an authentic handmade Tibetan singing bowl, a sacred instrument used for meditation. This library features 3 Kontakt patches with different ways to play this magical instruments: from bell like sounds to evolving deep soundscapes. Meditation Essence will add a touch of metaphysical inspiration to your music. Each patch has its own GUI with a lot of insert effects, chord manager and trigger effects that you can turn on and off with your keyboard. The sonic palette that you can obtain by tweaking these parameters is so vast that more than a sampled instrument, this is almost a full synthesizer!